Hi, we are Mark & Sallyanne. We came over to France from Wales after quite a few years of searching and finally finding the right place for us, our dreams and plans for the future with our children, running a holiday home and fishing lake, as well as enjoying the French way of life. You will find us in the Haute Vienne/Charente border, on the outskirts of a small village called St Gervais, in the commune of Videix, 5 miles south west of the chateau town of Rochechouart, which is just 40 minutes drive from Limoges International Airport. Our cosy chalet consists of an open plan lounge/kitchen. Shower/toilet room. 1 double bedroom. The lounge has a sofa bed so the accommodation can sleep 4 people quite comfortably. The kitchen is fully equipped with everything needed for self-catering purposes. There is a washing machine available for use in the separate utility room. The bedroom has a double bed with side cabinets, large wardrobe and storage shelves. There is a TV with DVD player only and CD system in the lounge, and we are still working on Internet and WIFI availability. The chalet is surrounded by a large veranda which gives you room to dine al-fresco while being protected from the sun but still allowing you views of the lake. Relax on the rocking chair and watch the wildlife and the butterflies. The accommodation come with the use of one of the lakes. The lake is private and is 1 acre in size. 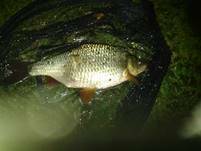 It has stocks of carp 17llb, roach to 1lb 12oz, black bass, zander and grass carp. There is a pre-build shelter at one end but there are no designated swims to you have the choice of where you want to locate yourself. There is a local bar in the village which serves food. On the banks of the Lacs de Haute Charente about 4 miles west of St Gervais, there is an English pub which serves good pub grub and has the usual British pub thing going on such as, karaoke nights, live music, quiz nights etc., here you will also find a range of leisure activities including a beach, with café and restaurant. Boating, fishing and horse riding. The nearby town of Rochechouart is built on a hill, its chateau overlooks the valley below and is clearly visible as you drive to the town. Here you will find main facilities such as café/bars, restaurants, pharmacy, boulangerie, patisseries & a charity shop which serves English tea and cake. There are 2 supermarkets for all your catering needs, beer and wine. There are several leisure lakes around the area, all with various facilities as mentioned above, with also arboreal adventure parks. Site of the horrific SS massacre in 1944 and now a war memorial. Limoges in the Limousin is a pretty, historical city known for its porcelain and enamels. This heritage can be explored in the National Porcelain Museum and the Fine Art Museum in Limoges, which has a room dedicated to enamels. There is also a Museum of the Resistance dedicated to the history of life in France from the declaration of war until after the liberation. Your holiday is confirmed by us in writing upon receipt of your deposit and Booking Form. Gite is to be vacated by 10.00 am to allow preparation for new arrivals. If it is necessary to alter your confirmed booking, we will try to accommodate you if at all possible. Remaining balance is to be paid 6 weeks before arrival date. Deux Lacs Jolie accept no responsibility in respect of any flight delays or any cancellations due to weather, strikes, terrorism, or any events beyond our control . You must also ensure that you have all the relevant up to date travel documents. We reserve the right to terminate your holiday if you are causing any harm or nuisance to other people, to the grounds, property or lake that are Deux Lacs Jolie, without compensation or any refund to you. If you cause damage, you will be liable for any replacement costs. You are expected to take reasonable care of all hired equipment, and leave it in a clean and tidy condition at the end of your holiday. Our liability to you will not exceed the amount paid to us for your holiday. You must take all the necessary steps to safeguard your own personal safety. We accept no liability for any death or personal injury, unless this results from our own negligence. We require a holding charge of £100 (payable on arrival). This will be returned when all appropriate checks of equipment have been made. An appropriate sum will be deducted if any equipment is damaged. In the unlikely event of any complaint, this must be reported to the Bailiff on site direct or put in writing no more than 7 days after your holiday. We accept your deposit and Booking Form on the understanding that you have read these Terms and Conditions. We recommend that you carry travel insurance as adequate protection for yourself and your belongings against theft, damage or injury. You should have an up to date passport and an E.H.I.C (European Health Insurance Card) as Insurance is not included in your Holiday. Booking with Deux Lacs Jolie signifies that you accept full responsibility, and that Deux Lacs Jolie is fully exempt from any claims whatsoever. If you should happen to have an accident or fall ill, please be aware French medical treatment is very expensive, and you will be expected to pay the full amount. All fish to be returned to the lake as soon as possible after being caught. Please treat our fish with care at all times. Landing nets/mats to be used at all times and disgorgers. Boilies only to be used as hook bait. Maximum size of leads - 3oz. Braided lines to be used sensibly. Minimum 12lb breaking strain line for carp. Mainly just use your common sense. Absolutely no smoking in the Gite.